Lake Orta is certalny the most romantic location in the Lake District. Hills and mountains are very close to the Lake thus lending a fairy-tale atmosphere to the villages surrounding the water. Orta San Giulio is at the end of a small peninsula that juts out into Lake Orta. Intricate wrought-iron balustrades and balconies adorn the 18th century buildings of this small, intimate and relaxing town. The main square of the town looks across the lake to the lovely island of San Giulio, which you can reach by boat. This charming lake, surrounded by gentle hills, is the most enchanting and romantic of the Italian Lakes. Its romance has inspired artists, poets and writers from all over the world for century and for lovers it is hopelessly romantic. 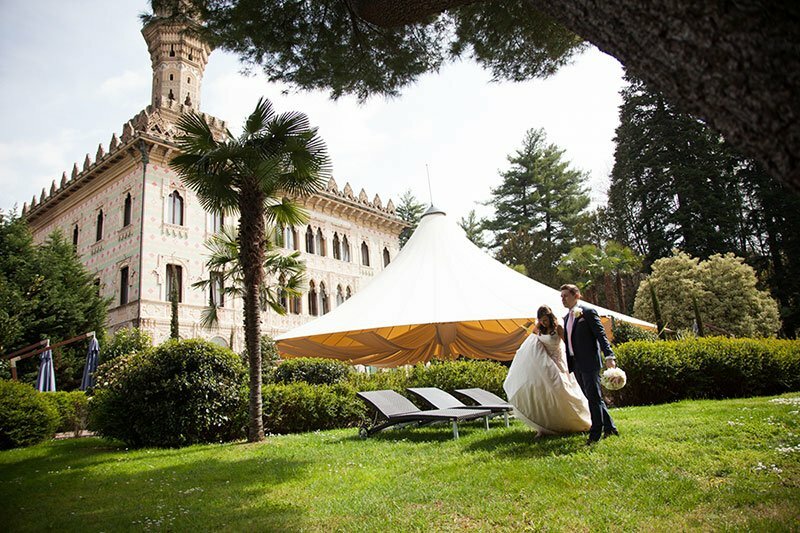 Your Lake Orta Wedding will have the same atmosphere as in the ancient times and you will live and relive it as in a fairytale. 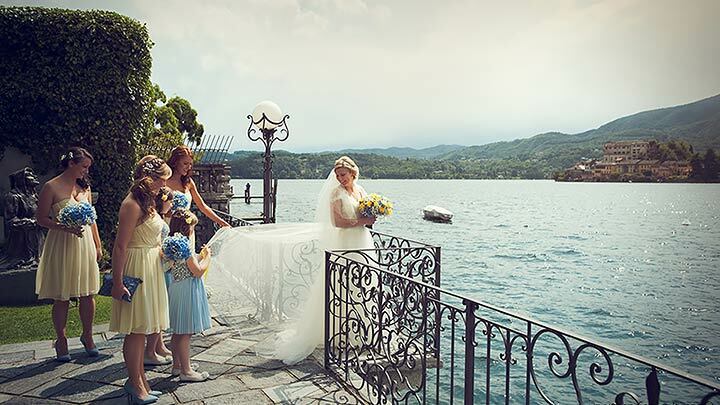 At only 45 minutes drive from Malpensa Airport, Lake Orta is the perfect choice for your fairy-tale wedding in Italy. The area around Lake Orta has long been a favorite tourists, thanks to the quiet beauty of the landscape, its fascinating history and its wealth of artistic treasures, principally Romanesque and Baroque architecture. Little but charming, Lake Orta lies to the west of Lake Maggiore, in Piedmont - Northen Italy. It is a minor star in the costellation of the subalpine lakes, but all the fascination and the history of the larger lakes seem to be concentrated in this short space. The town of Orta San Giulio is also the only Italian lakes' car-free town. Orta holds the visitors attention, with its houses roofed with thick slate tiles, it's lakeside Motta Square, called Il Palazzotto, with its garden cafés, ovelooked by the Palazzo della Comunità or Palazotto - a frescoed 16th century town hall. You can get married at the wedding hall in the town square, a 16th-century building with frescoed walls, an outside stairway and a tiny campanile breaking through the grey roof like a chimney. Or at the elegant Villa Bossi, a beautiful 17th century villa facing the Lake of Orta. 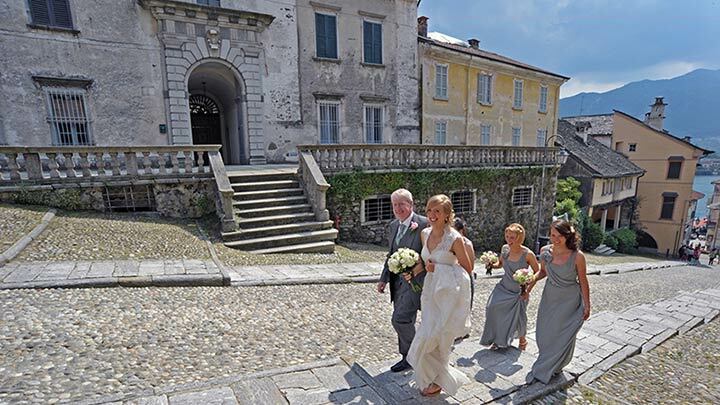 Here brides have a unique occasion fo Italy to celebrate a Villa Bossi, a beautiful 17th century villa facing the Lake of Orta. Here brides have a unique occasion fo Italy to celebrate a civil ceremony in a beautiful terraced garden on the lake shore arriving with a romantic little rowing boat. If you prefer a religious wedding there is a little charming church on the top of the a hill in Orta just few steps from the main square from where you will appreciate a precius panorama. Perched on a rocky ledge high above the western shore, a few kilometres from Orta, the Sanctuary of the Madonna del Sasso is also worth a visit. 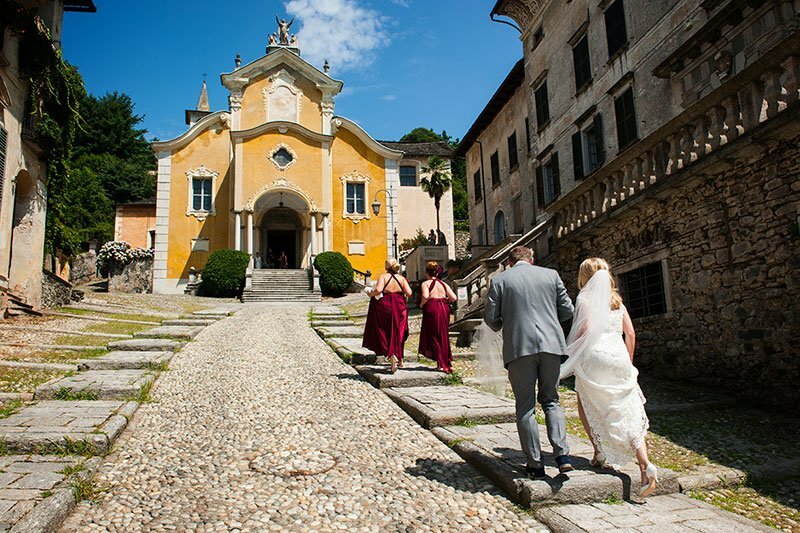 The Sanctuary, a beautiful example of baroque style, is an extraordinary panoramic point, a perfect place for a Wedding Reception at Lake Orta. are our specialty. Find out why! 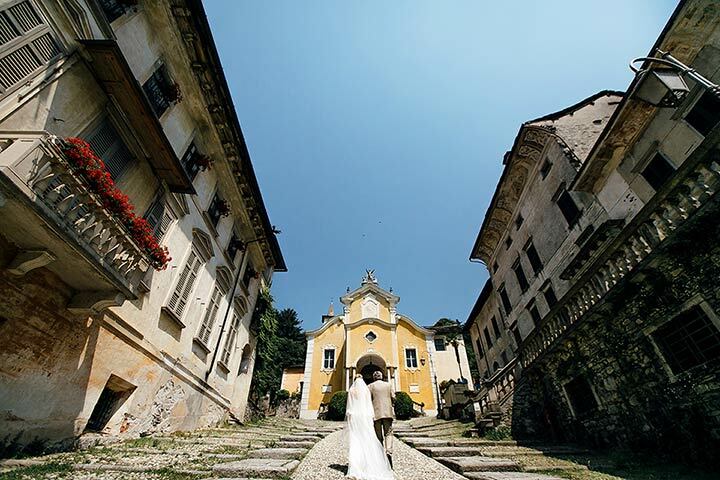 When we think about Lake Orta we always think about authentic Italian style, cobbled roads and relaxed and laid down weddings. But who said that all this wonderful authentic medieval Italian village cannot fit for a chic and elegant wedding too? I personally think that it can fit perfectly! This is the case of Cheryl and Paul. Lake Orta is a perfect destination if you want to live some days with no stress and pressure. Here you will get real and authentic Italy! 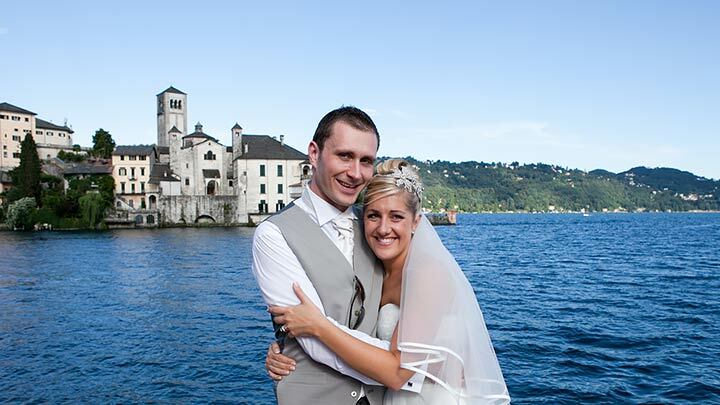 Laura and Brian chose Lake Orta for these reasons. They wanted a lovely, cosy, intimate, relaxing wedding on the shores with close family and friends. 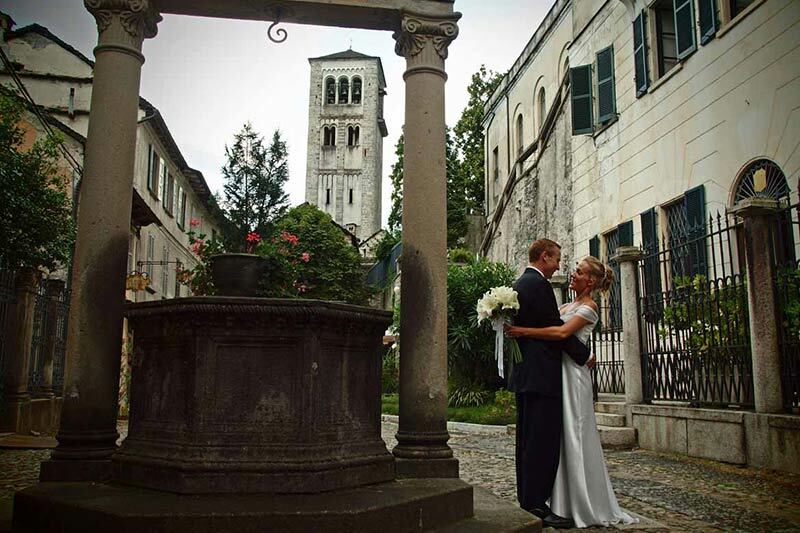 A wedding on Lake Orta… From Russia with Love! We love using the tagline of one of the most famous 007 movie with Sean Connery playing James Bond dated back to 1963. A great movie indeed with the final shot in Italy itself. Have a look on this fun and joyful Russian wedding on Lake Orta! Santa Maria Assunta church is the parish church of Orta village. 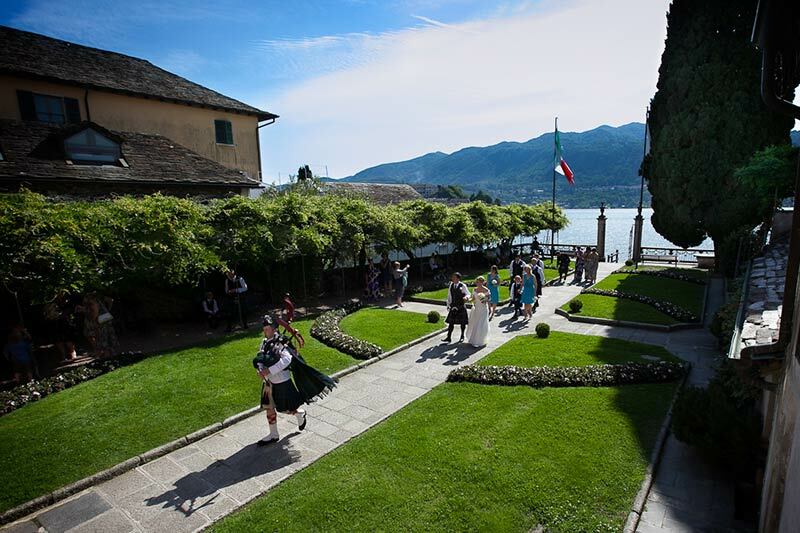 It is surely one of the most romantic ceremony venue for a Roman Catholic ceremony on Lake Orta. 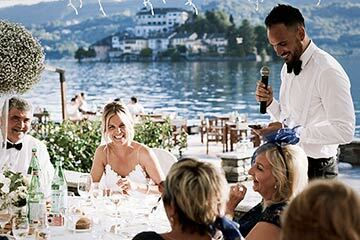 If you are looking for a lovely, romantic but also fun wedding in Italy, Lake Orta could be the perfect destination.